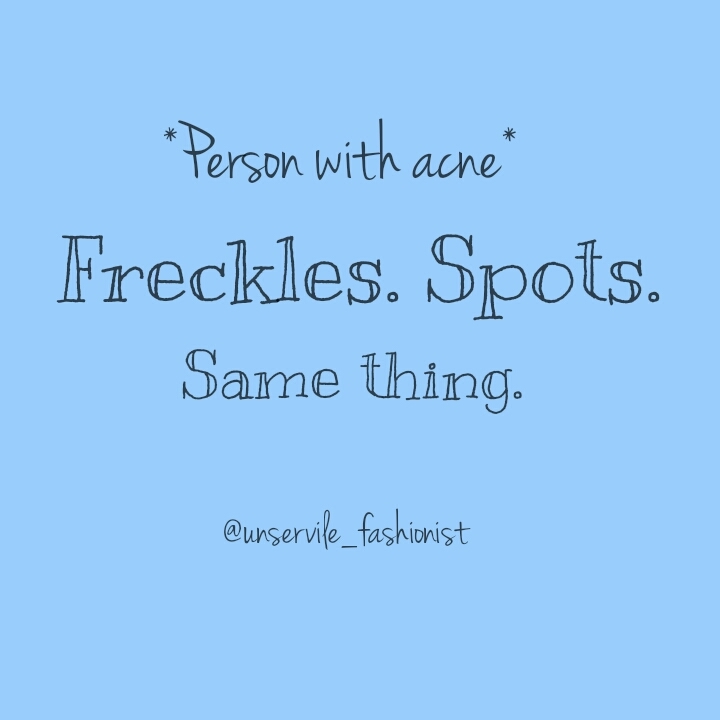 Long time no acne jokes/rants/mentions right? If you think this is because it cleared up, you have no idea how far you are from the truth. Ok so, lots of people hate acne. I have heard many a people have gotten depressed due to acne. Let's shine some light on the matter shall we? Skin condition, usually of the face, caused by the inflammation of sebaceous glands through bacterial infection. Characterised by red pimples, blackheads, whiteheads, etc. Yes, I don't have the serious kind that would drive people to try drugs, injections and stuff. But, I feel I can relate because I have had acne for a very long time so I have gotten used to it. So instead of focusing on the negative, we're going to be looking at the silver lining in those dark grey clouds. Contrary to popular belief there are some pros of acne far-fetched as they might seem to be. Well, you obviously don't walk up to someone and say "Hi, I like your acne!" You, the "owner" of the acne could use a self-depreciating remark to break the ice in many situations. Like seriously, it just might work. Or not. You never know, depends on your audience. 2. Perfect excuse for not being interested in slapping on full make up. I'm one of those people who are just not interested in foundation and concealer and the full works. At least not yet. So many people keep asking me "Why don't you wear makeup?" Before, I'd try to explain that I'm a lipstick and eyeliner kinda person which would of course lead to the "Why?!!!" which is a really dark road filled with odd looks and lots of follow up questions. You don't wanna go there. These days, I just point at my face with a resigned expression "It's because of my acne" If they still don't look convinced, I add "You know, I don't wanna clog my pores...". They then nod understandingly. Person with acne: Ugh I'm just so tired of acne, so frustrating! Me: What products have you used? Person with acne: Lots! Right now I'm using Aleo Vera, honey sugar scrub and other organic stuff. And this leads to other cool things and we eventuially become besties. Random person with perfect skin: So... that's a nice plant. Me: Yea, it's very... uhm... green. And we both look away. No happy ending there. Freckles? Yes! Freckles! Cute aren't they? That's right people! We don't need to do anything to get birthmarks and/or freckles unlike some people who use make up (pencils) to draw freckles. Seriously, I kid you not. It's a thing. "This top would look so much better on me if I didn't have acne." *Brows not coming out good this morning* "It's because of this stupid acne!" *Wakes up in a bad mood* "If only I didn't have acne!" Trust me, it's a good outlet. I haven't reached my end yet (sadly) so I don't quite have any story to tell except helping people understand the basics of what causes acne and of course writing stuff like this. However, it's a thought that could keep you going you know. It sort of annoys me when people who've never had acne try to tell me how to go about it. This simply means that if you eventually want to make "helping pople cure acne" your life's work, you have a good shot because, experience. So! What other benefits can you think of? 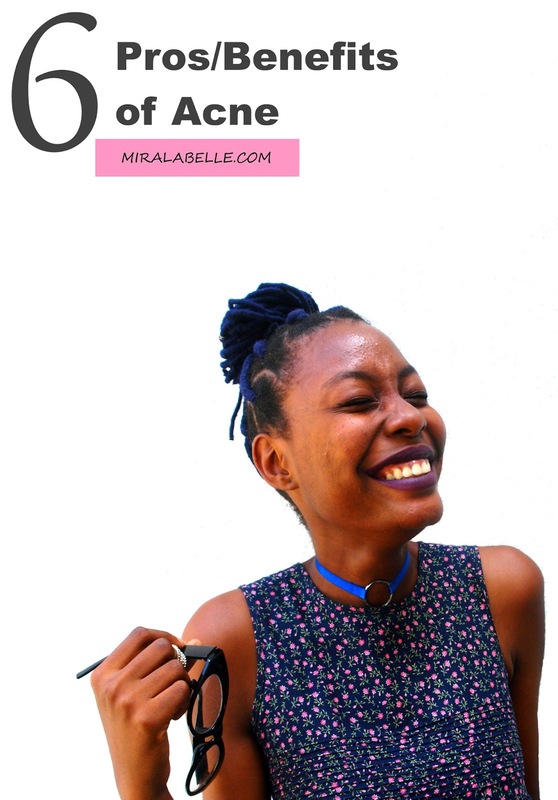 Don't forget to follow me on Twitter and Pinterest, let's connect! Such an interesting and funny post! You're so right about about acne being a conversation starter, especially in the weirdest place yunno? Phew! I can't tell you how relieved I am to know to enjoyed this post. I usually dont do this kind of post so I was sort of anxious thinking of negative reactions so yay! Glad you enjoyed it! Lool. When I saw the picture up there, I was curious because I've had to deal with pimples and dark spots and someone's telling me there are benefits? It sure is a great convo starter. Lol @ Hi, I like your acne and blaming it for dogs death. We werk with what we've got! LOOOL! This was a fun one. Totally blame it all on the acne. Ha. I'm happy you found it entertaining because at some points, I was very tempted to press backspace but I thought "what the heck. It's my blog anyways". Lol... ijenna wouldn't kill me. Very funny post. I'm not wearing make up today and people keep asking me if I'm feeling well.I know I don't look so good, and I blame it on my acne. These are really sad pros...lol...but funny! And true! I enjoyed this post Mira. came across this one.. twas entertaining lol now I don't feel so bad bout my acne.